And in these same Wastelands, others gather to confront their destinies. The warlike Barghast, thwarted in their vengeance against the Tiste Edur, seek new enemies beyond the border and Onos Toolan, once immortal T’lan Imass now mortal commander of the White Face clan, faces insurrection. To the south, the Perish Grey Helms parlay passage through the treacherous kingdom of Bolkando. Their intention is to rendezvous with the Bonehunters but their vow of allegiance to the Malazans will be sorely tested. And ancient enclaves of an Elder Race are in search of salvation–not among their own kind, but among humans–as an old enemy draws ever closer to the last surviving bastion of the K’Chain Che’Malle. So this last great army of the Malazan Empire is resolved to make one final defiant, heroic stand in the name of redemption. But can deeds be heroic when there is no one to witness them? And can that which is not witnessed forever change the world? Destines are rarely simple, truths never clear but one certainty is that time is on no one’s side. For the Deck of Dragons has been read, unleashing a dread power that none can comprehend (goodreads.com). This was the first time I have read the author’s note and I am glad I did. In Dust of Dreams, Erikson explains that unlike all his other books this one will end on a cliffhanger because these last two books were supposed to be one. That being said I wasn’t expecting a great ending like in all of the other books. I was wrong. In Dust of Dreams we follow Tavore’s army, as well as the Letharii army led by Brys Beddit through the Wastelands. There is also the Perish army as well as the Khundryl and Bolkando who journey through there as well. For most of the book we don’t know why they are going through it, and they do spend the entire book in the Wastelands, so I was surprised to not find it at all boring. I guess with Fiddler, Quick Ben, Hedge, and Bottle I was pretty entertained. There was always some interesting thing going on because many of the soldiers were trying to figure out what was going on just like I was. I absolutely love following the Bonehunters! We also follow the Barghast who are led by none other than Tool and this part of the book was very engaging as well. I couldn’t believe what happens to Tool and his wife. It was just awful. One thing I love about Dust of Dreams is that we actually get to follow around the dreaded K’Chain Che’Malle! It was incredible getting to know more about them; who they are and what they want, etc. Epic! You just have to discover this for yourself, but I will say their confrontation with their enemy at the very ending of the book was incredible. Oh! and I will most certainly say that I just love Ubala Pung! He is quite a character and down right hilarious. I also really enjoy Tehol and Bugg as well. I just can’t get enough of them! I suppose there is only one thing that I didn’t like about the book. The story line following “The Snake” wasn’t at all interesting to me. It was really sad no doubt, but other than that I didn’t much care for it. However, I stuck with it and read it all and I’m still not sure what the deal was with all the children. Maybe I missed something. I know they were running from something but it was all kind of weird. Also, the part about the Shake and Yan Tovis with her brother was kind of interesting, but other story lines were so much better. I guess it just depends on who your favorite characters are. We can really see everything starting to come together by the end of the book and what an ending it was! It was definitely a cliffhanger and I am so glad that I have the next book already. After following the Bonehunters for so long and them getting into a battle at the end was incredibly epic, brutal, and down right nail-biting. OMG! I wasn’t expecting such an amazing ending! 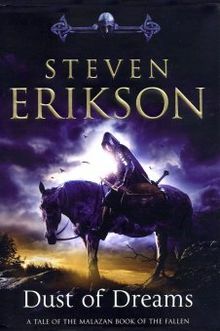 I really look forward to how Erikson plans on ending this massive series! I hope all questions will be answered. As I have said plenty of times before the biggest downfall of the series is way too many minor characters, subplots, and at times the utter confusion of the story. Nonetheless, it is still a great book and series. And just so you know Dust of Dreams is probably one of the most easy to read books of the series. I found it more straightforward than some of the other books though there are still many questions that need to be answered. The book was really entertaining and well written. I can’t wait to start the final book of the series! I’ve just bought the first book in this series – looks like I’ve got plenty to look forward to!